Home » Blog » Amazon Deal Blog » Plink: Spend $10 at Papa Johns Get a $10 Gift Card! Plink: Spend $10 at Papa Johns Get a $10 Gift Card! 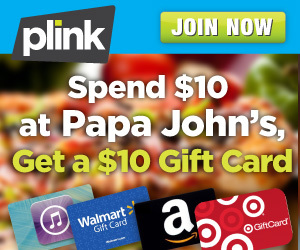 Join Plink make a $10 Papa Johns purchase and get a $10 Gift Card! Sign up for Plink today, make a minimum $10 purchase at Papa John’s by Sunday, 5/5 11:59 EST, and they will give you 1,000 Plink Points – enough to redeem for a $10 Gift Card of your choice! Receive gift cards for places like Amazon.com, Target, Walmart, Kohls, Starbucks, Regal Cinemas and more! Bonus 1,000 Plink Points will be awarded 7 days after the posted transaction date. You will need to use the links in this post to receive the 1,000 Plink points. This is an exclusive offer so, Papa John’s will not be visible on Plink.com. Bonus 1,000 Plink Points will be awarded within 7 business days of the transaction posting date. I signed up but I don’t see anything about Papa Johns? They aren’t on my list of offers that I can add to get points. Will it just automatically give me points without me adding them to my wallet? That is what the offer we got said, that it was a private offer so it would not show up but you would receive the points 7 days after the transaction posting date. Just make sure you use the links through this post, I take it that is how they track it.